Andrey Federovskiy’s case stands out among the many immigration arrests in San Diego. Interpol put out an international arrest warrant for the Kazakh native. But there’s also reason to believe Federovskiy’s claims that the charges are fabricated by a government that targets Christians. Update: On Thursday, Immigration Judge Phillip Law decided to terminate Andrey Federovskiy’s case, meaning his application for asylum in the United States can proceed. After one of the largest ICE operations in San Diego in recent history led to 115 arrests earlier this year, the agency touted in a press release the arrests of what it said were several dangerous criminals. All but one of those listed were Mexican nationals with criminal convictions for entering the country illegally, domestic violence, DUIs and more. A Kazakh national, he was wanted in his home country for evading $3.9 million in taxes. Federovskiy denies the allegations against him and said he never even knew about them until his first immigration hearing. He’s seeking asylum in the United States, citing fears of religious and political persecution from the Kazakh government. The international call for his arrest, he believes, is part of that persecution. Federovskiy’s case is in some ways exceptional. Few of the immigration cases or ICE arrests that make the news involve Kazakhstan, and few involve immigrants whose home countries have issued international warrants for their arrests. Yet in other ways Federovskiy’s case demonstrates the hurdles typical of so many immigration cases: how paperwork and bureaucracy can leave immigrants in limbo, potentially at risk for arrest; how immigration officials tout criminal allegations against someone, only to later back away from them; and finally, how a case in which an individual’s life may hang in the balance is decided in an administrative court, where the standards guiding evidence and hearsay are much lower than in criminal court. Federovskiy arrived in the United States in March 2017 on a tourist visa. Federovskiy left Kazakhstan in September 2016, he said. He went to Croatia, but the country was facing an influx of Syrian refugees, and there was no possibility of him staying there as a migrant more permanently. 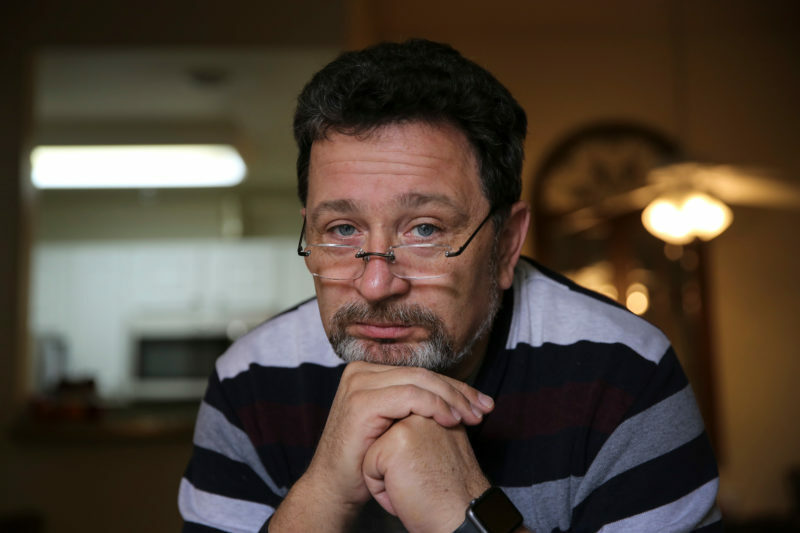 He came to San Diego because a former pastor of his church, Maxim Maxime, had come here years ago from Kazakhstan and told him to join him when he learned of Federovskiy’s problems in their home country. Federovskiy and his wife stayed with Maxime initially before renting a home in east Oceanside. They submitted an application for asylum in July, saying they feared returning to Kazakhstan because as Christians, they’re part of a religious minority and experienced government persecution. ICE said it arrested Federovskiy in February because he had overstayed his visa, which expired in September 2017. After submitting his asylum application, he received a notice saying he could remain in the country while he went through the asylum process. He and his wife applied for work permits upon receiving the notice. But when the permits arrived, they erroneously mixed up the couple’s identities – the permit with Federovskiy’s name had his wife’s photo. Federovskiy, who spoke with VOSD through a Russian interpreter, said that when ICE agents arrested him, he initially thought they were there because of the permit mix-up. That morning in February, Federovskiy said he opened the door to agents. He doesn’t speak English, but saw his name on a piece of paper they showed him, so he let them in and allowed them to go through his papers. Federovskiy said they took some of the papers, including the notice saying he could remain in the United States while his asylum application was pending, and the incorrect work permits. ICE now doesn’t seem to have those papers – Federovskiy, his wife and immigration attorney are left with copies. His attorney, Nadia Galash, insists that because of the notice from U.S. Citizenship and Immigration Services acknowledging his asylum application, he should never have been arrested and was not here illegally. The disconnect between USCIS, which handles asylum requests, and ICE, which conducts immigration enforcement, became even clearer the day Federovskiy was released from immigration detention. He received his new Social Security card in the mail that same day, so he could work while he waited for his asylum request to be processed. Often, ICE leaves people awaiting their asylum hearings alone. Jacobs suspects that the agency went after him because of the international arrest warrant sent out by the Kazakh government through the police agency Interpol, called a Red Notice. An ICE spokeswoman said the Red Notice didn’t play any role in Federovskiy’s arrest. Federovskiy said he didn’t even know the Kazakh government had an international warrant out for his arrest until his first bond hearing, where he was trying to be released from immigration detention. That’s when his attorney saw the Red Notice mentioned in the newspaper. But the Department of Homeland Security attorney Lauren Bortolotti handling the case knew all about it. “It’s a very large tax evasion case,” Bartolotti said. According to the Interpol notice, Federovskiy was wanted by the government of Kazakhstan for the equivalent of $3.9 million in tax evasion after creating a company, KazMetallPererabotka LLP, and not filing taxes. “That’s not even my company,” Federovskiy exclaimed in Russian to his attorney during the hearing. “If he had such big money, why would he come here and ask for protection?” said Galash, herself a Russian refugee to the United States decades ago. The notice is evidence, Galash argued, that Federovskiy is being persecuted by the Kazakh government. Immigration Judge Olga Attia said that given the gravity of the alleged crime, she wanted to hear more from Federovskiy’s attorney and give her time to prepare arguments. “The allegation that the respondent is guilty of tax evasion of roughly $3.9 million is not a simple allegation,” Attia said, before deciding to continue the bond hearing to another day when Galash prepared to contest the allegations. Jacobs said she told Galash to advise Federovskiy that he likely wasn’t going to be released from detention under the circumstances. Then, strangely, the importance of the Red Notice waned. At his next hearing a few weeks later, the prosecutor and Federovksiy’s attorney agreed on a $3,000 bond – a relatively low sum considering the government argued weeks earlier that he was a flight risk. Galash had told the DHS attorney a $5,000 bond would be reasonable. The DHS attorney kicked it lower. “It was extremely rare,” Galash told me later. Within a matter of days, Federovskiy was back home. Within a week, ICE had even removed his ankle bracelet, exhibiting further trust that he wouldn’t flee before his next hearing. Pressed about the role of the Interpol notice in his arrest, an ICE spokeswoman said again, “We did not target him for the red notice” – yet the department included it in its press release highlighting criminals it had captured. And though Federovskiy and his wife both had expired tourist visas as they awaited their asylum hearings, only he was arrested. The Open Dialog Foundation, an organization focused on democracy and human rights in post-Soviet countries, has documented several instances of countries like Kazakhstan abusing Interpol notices, using them to track political dissidents or other people who have left the country because of conflict with the government. Federovskiy said the tax fraud accusations aren’t true – but that they are linked to why he left and why he fears going back. Federovskiy is an evangelical Christian – a minority religion in majority-Muslim Kazakhstan. Beginning in 2011, the country began adopting laws that required minority religious groups to register, banned unregistered religious activity, imposed compulsory religious censorship and required the central and local governments’ approval to build or open new places of worship. Kazakhstan convicted at least 22 people in 2017 who practiced minority religions on criminal charges of “inciting religious discord” or “membership in a banned organization,” according to a Human Rights Watch report. Maxime, the former pastor who persuaded Federovskiy to come to Oceanside, said he had been criminally charged for his religious practice and accused of “harming the health” of others through his religion. That’s why he left years ago, but he had family with legal status in the United States and didn’t need to ask for asylum at the time in order to migrate here. Federovskiy said his problems began after 2006. That year, a famous Texas pastor came to visit the Evangelical Christian community in Kazakhstan. It was a high-profile visit locally, and Federovskiy said he was the pastor’s driver. Soon after, he said he started to feel as though he was being watched. A few years later, his company started having problems with the government. Federovskiy owned a metallurgy company, which deals with the production of metals. In 2011, he filed a claim against the government, basically saying it hadn’t given him his proper tax rebate. The government responded by filing criminal charges against him for tax evasion. He was found guilty, but later that same day, included in mass pardons from the Kazakh president that happen regularly, he said. He wasn’t allowed to work for pay a while, though. The metallurgy industry is small, so he volunteered as an unpaid consultant for another company, hoping he could get back into the industry later. But the government went after that company next – that’s the company on the Interpol notice. Federovskiy said officials tried to get him to falsely testify against the owner of that company. Federovskiy said he believes that officials then pressured the owner of the company to testify against him. After someone in law enforcement told Federovskiy the government really was after him, he decided to leave. “The law enforcement official of Kazakhstan state to [Federovskiy] that there is an order from his superiors to persecute him at any cost and if [Federovskiy] try to flee the country, the government of Kazakhstan would use all its power to find him at any place of the world, bring him back, imprison him, and create such harsh conditions that [Federovskiy] would commit suicide,” Federovskiy’s attorney wrote in an immigration court filing. It might seem odd for a government to allege financial crimes as a form of religious persecution, but it’s happened in Kazakhstan before, said Yevgeniy Zhovtis, a Kazakh human rights activist and the director of the Kazakhstan International Bureau for Human Rights and Rule of Law. In 2006, for example, the United States Commission on International Religious Freedom denounced Kazakh officials for demolishing a property owned by Hare Krishnas during a land dispute. “Although Kazakh officials claim that the dispute is purely economic in nature, only homes owned by Hare Krishna members were destroyed,” the commission said. Zhovtis isn’t familiar with Federovskiy or his case, but said the story does not surprise him. “In principle, Kazakhstan’s religious war is one of the most oppressive in the whole USSR region,” he said. Federovskiy said going back to Kazakhstan isn’t an option. In fact, seeking refuge anywhere but the United States may not be. The Red Notice cemented that in his mind. If he goes back to Kazakhstan, Federovskiy said he will surely be sent to prison, where he believes he’ll be tortured. Mihra Rittmann, a Central Asia researcher for Human Rights Watch who is not familiar with Federovskiy’s case, said torture in Kazakh prisons is a real issue. “Torture remains a problem in Kazakhstan and has been acknowledged by officials,” she said. If the United States takes the Kazakh government’s allegations against him seriously, surely other governments will do the same, he reasons. “I don’t have a Plan B,” Federovskiy said. If he’s allowed to stay, Federovskiy wants to learn English – he and his wife have already started taking classes at a local community college – and start working. He eventually hopes to have his own business, like he did in Kazakhstan. Federovskiy’s attorney filed a motion to terminate his removal proceedings, on the grounds that he submitted his asylum application before his tourist visa expired. The Department of Homeland Security submitted a motion in response, disagreeing. On Thursday, an immigration judge will decide whether to stop the removal proceedings and let Federovskiy’s asylum request continue.